A highly-promoted feature in the 2011 Ford Explorer are its new inflatable rear seat belts. The not-so-highly-promoted working stiffs that helped make it happen? Human cadavers. Here's how automakers still quietly use dead people to make your car safer. When automakers and safety advocates show off the results of crash tests, they inevitably run video showing empty vehicles or crash test dummies; back in the 1980s, they even turned the dummies into lovable cartoon characters. What the industry doesn't like talking about is how much of the safety innovation in vehicles was built around testing cadavers. Since the 1930s, when researchers at Wayne State University first threw a body down an elevator shaft to see what kind of forces it could sustain, cadavers have been essential to making driving safer. Every part of a car touching on safety — from steering columns and laminated windshields to side-impact air bags — has science from cadaver tests making sure they work. "It's still very important," said Priya Prasad, a former top safety researcher at Ford. "Even though we have very good math modeling of dummies, human modeling hasn't reached that state yet." Automakers prefer to keep their names away from such ickiness. When a Swedish researcher told a newspaper in 2008 that General Motors and Saab were using cadavers in research, both companies quickly denied the story. And as far as the denial goes, it's true: automakers don't have the medical resources that cadaver tests require. But universities do. The National Highway Traffic Safety Administration funds scores of cadaver tests at schools across the country every year; many of those schools also get grants from automakers. And the data they gather can be shared widely. That's the case with Ford's inflatable seat belts, an idea it's been testing for several years. The 2011 Explorer will be the first vehicle in the world to offer them, and Ford has made the belts a highlight of the safety features offered to compete against other family haulers. But before the system could be sold, Ford had to answer myriad questions. Just because it has an air bag doesn't mean the belts would automatically do a better job of shielding passengers from injuries than standard seat belts. It could even be worse: What would happen to children who were sleeping on the belts when they inflated? Most of Ford's tests used the family of dummies developed by the industry, including ones that mimic children. But without a cadaver test, Ford couldn't know for sure how the inflatable belt would affect internal organs and tissues. Typically in cadaver tests, as the one pictured here run by the University of Michigan Transportation Research Institute, researchers swaddle the body in stockings, including one over its face, partly for scientific reasons and partly out of respect. The arms and hands, if still attached, are bound in place to keep them from moving during a simulated crash, and sensors record the forces on various parts. After the test, researchers would likely have used x-rays and autopsies to examine how much damage the cadaver sustained. Ford shared the results with NHTSA but deemed them confidential business information — meaning we can't access them by way of a Freedom of Information Act (FOIA) request — but given that the belts are going on sale, we can guess the tests were successful. Universities which run such tests have standard procedures for handling cadavers that cover every step of the process, from informing the relatives of a donor what the body will be used for to disposing of the remains. Ford spokesman Wes Sherwood said the company, like the rest of the industry, was trying to move into digital modeling for crash testing whenever possible. It's far cheaper to run thousands of computer simulations of a crash test with a digital wireframe than to do even one test with a dummy. 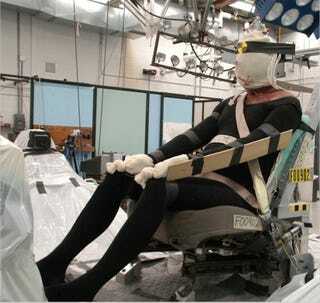 And either test is less squeamish to the general public than crash-testing involving a once-living, breathing body. It's no wonder they're in no mood to publicize their continued, but still very necessary, use. "If there's a specific need (for a cadaver test), we will look outside the company to see if someone can help, but most of our work is digital," Sherwood said. Albert King, a professor at Wayne State who has been working in cadaver research since 1966, said the school's tests had fallen off in recent years; where it used to do one cadaver test a month on average, it now did a few a year if that. King once estimated that such tests saved 8,500 lives a year. The major reason? After six decades, there's not much room left to improve safety inside the car. With even low-end vehicles offering eight air bags, most research has turned toward how to prevent crashes in the first place. "We have most of the information we need," King said. "The rest of it we're doing through computer." But it's not just cars that benefit. Researchers have drawn on Wayne State's cadaver work to design helmets that might prevent concussions in NFL players. NASA has used cadavers to test crashworthiness in the past, and the Defense Department-backed studies rely on cadaver work to better understand traumatic brain injuries. Prasad says as good as computer models are, they still can't capture the exact essence of how human tissue reacts. "It's always a good idea when you're developing something to do cadaver testing," he said.